The Enforcement Directorate is set to begin penal action for alleged foreign exchange dealings and money laundering in award of contracts in the 2010 Commonwealth Games, beginning with a notice for the alleged forex violation to the tune of Rs 185 crore. The Central Election Committee of the BJP, scheduled to complete its process of finalising all its candidates for Uttar Pradesh, Punjab and Goa today, deferred its meetings by another day. The party’s UP leaders requested it to wait for an exodus from the BSP to give the BJP’s election prospects a big boost. Law Minister Salman Khurshid has favoured reaching out to the Opposition as also allies on the issue of Lokpal and other issues and dismissed suggestions that Trinamool Congress leader Mamata Banerjee was a ‘difficult customer’. Even though PPCC president Amarinder Singh tried to downplay his letter to Defence Minister AK Antony on the issue of birth records of Army chief VK Singh, calling it his personal opinion, his party, it seems, is not too happy at his intrusion into what is clearly an “internal” matter of Armed Forces. A special court here on Tuesday extended till January 16 the judicial custody of city woman journalist Jigna Vora, accused in the J Dey murder case, a lawyer said. “Special Judge SM Modak of MCOCA (Maharashtra Control of Organised Crime Act) court extended her judicial custody,” Vora’s lawyer Jayesh Vithlani told IANS. BJP-ruled Madhya Pradesh has brought in a stringent law against cow slaughter that has raised the jail term from the current three years to seven years for violators. The Madhya Pradesh Cow Progeny Slaughter Prevention (Amendment) Bill has received the Presidential assent following which it has become an Act, an official release said today. In a setback to suspended IPS officer Sanjiv Bhatt, the Gujarat High Court has rejected his plea seeking quashing of a complaint in a 1998 custodial torture case and directed the Porbander district court to proceed with the criminal trial against the senior cop. A 20-year-old ‘Psycho’ Briton, accused of killing Indian student Anuj Bidve in an unprovoked attack, was today remanded to custody until March 20 when the next hearing is scheduled in the widely publicised case. Looking to exploit the market where Tata Motors seems to have failed with its Nano over the past two years, Bajaj Auto Limited (BAL) today unveiled a mini four-wheeler which would be available for sale later this year. The Lashkar-e-Toiba is raising a group of 21 female terrorists at its training camps in Pakistan-occupied Kashmir for carrying out sabotage activities in India, Army sources said today. West Bengal Chief Minister Mamata Banerjee Tuesday alleged that the Congress was colluding with the Left to malign her government over relabelling a building named after late Prime Minister Indira Gandhi. Opposition party in Uttar Pradesh Samajwadi Party today said it would approach the Election Commission, asking it to take cognisance of the statues of state Chief Minister Mayawati and her party’s election symbol dotting the city. The Directorate, according to sources, is set to issue a series of violation notices for amount which could total to Rs 500 crore in the CWG contracts as the agency has recently obtained information from the RBI against various contracting firms and agencies for contravention of the Foreign Exchange Management Act (FEMA). According to sources, the Enforcement Directorate is set to issue Foreign Exchange Management Act notices to a Singapore-based firm Pico Event Marketing India Private Limited (PEMI) and its three Directors for allegedly "blatantly flouting the mandatory regulatory framework relating to foreign exchange investments in India" involving an amount of Rs 185 crore. When contacted, Enforcement Directorate Deputy Director and Investigating Officer (IO) of the CWG probe Rajeshwar Singh refused to comment on the status of the probe. The ED has already filed its complaint (equivalent of a charge sheet) in this regard with the adjudicating authority of Foreign Exchange Act in the country. The Directorate, according to the chargesheet, has found Pico Event Marketing India Private Limited was "incorporated solely for the purpose of getting overlays contract from the CWG Organising Committee with 100 per cent foreign directorship." The agency, according to sources, has found that Pico Event Marketing India Private Limited, despite a 100 per cent wholly owned subsidiary of foreign company Pico Indian Exhibit Contractor Private Limited Singapore and being a de-facto branch/liaison office for conducting its business in India, was required to have prior approval of the RBI for conducting business in the country. "However, it (PEMI) failed to seek RBI approval as provided under the Foreign Exchange Management Act regulations. The matters relating to issuance of shares to foreign party was also not reported by Pico Event Marketing India Private Limited to RBI within the mandatory stipulated period," the agency said. A number of cases involving other CWG contracts, which were under Enforcement Directorate scanner since it took over the probe after the sporting extravaganza in October 2010, will now see the beginning of penal and penalty proceedings, the sources said. The process of migration from BSP to BJP began with two former BSP ministers Babu Singh Kushwaha and Badshah Singh being welcomed into the party fold by UP state chief Surya Pratap Shahi and senior state leader Vinay Katiyar here today. Kushwaha, once a member of the inner coterie of Mayawati, was sacked and then removed from the party some time in April last year by the BSP supremo in the wake of his alleged involvement in misappropriation of National Rural Health Mission (NRHM) funds. The expose led to the killing of a senior doctor, arrested in this connection, on the jail premises. A CBI inquiry in this connection is currently underway. 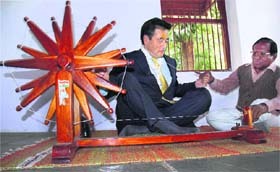 Badshah Singh was the Labour Minister in Mayawati’s Council of Ministers. She sacked him in October last year after the state Lokayukta held him guilty of grabbing government land meant to construct a hospital and building his two-storeyed house on it. He later obtained a stay against the eviction from a local court. In addition, the UP Chief Electoral Officer (CEO) has ordered a probe into the name controversy surrounding Kushwaha and Badshah Singh. According to a PIL in the Allahabad High Court, Babu Singh Kushwaha had committed a fraud on the people by withholding his real name Ram Charan Kushwaha, that is mentioned in his school-leaving certificate. Akhilesh Upadhyaya, a Samajwadi Party worker from Mahoba, complained to the Lokayukta that Badshah Singh’s original name was Ramendra Singh and he had used it to get possession of unauthorised properties. Sources said the committee is now scheduled to meet tomorrow. Introducing the two, Katiyar said, “I believe that Mayawati is the source of all corruption in UP and she alone looted the state for the last five years.” He also pronounced Babu Singh Kushwaha as “the most honest minister”, pointing out that he would be fully vindicated in the CBI investigations currently on. As for Badshah Singh, Katiyar mentioned how in the past, Singh had been a four-time BJP legislator and welcomed the former comrade back into the party fold with open arms. The Election Commission is also taking a strong view in case of former Labour minister Badshah Singh, who has been indicted by UP Lokayukta Justice NK Mehrotra. Even as the slugfest continued between the Congress and the BJP over the Lokpal Bill getting stuck in the Rajya Sabha, Khurshid said the government should reach out to the Opposition on a priority basis. “... I think we should now make that a priority- reaching out to Opposition, because there are many issues on which they share our concerns. They should not just hold back because they believe holding back gives them an advantage... We should convince them about this,” he said. 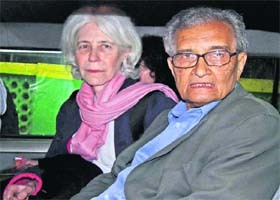 In a TV interview, Khurshid also said that “genuine concerns” of UPA’s allies should be addressed. “Then we have our own allies as well who have genuine concern and I think we should address those genuine concerns. We can find a solution...,” he said. “We have to shake hands, we have to get our eyeballs to meet. We have helped them and they have helped us in matters that are of critical importance to the country,” he said, adding that during a war, parties do not score political points over each other. To a question on Mamata Banerjee, Khurshid scoffed at suggestions that she was a ‘difficult customer’. “She is not a difficult customer... Her politics is politics of passion. She has great conviction, she is a very determined person. When you have someone of that nature, you need some technique to communicate better. I think we’ll work on that,” he said. He also favoured developing interlocutors to communicate better with the key UPA ally. “He (Amarinder Singh) had already clarified that this was his personal view. Generally, politicians should not comment on the internal affairs of the Armed forces,” AICC general secretary Janardan Dwivedi was quoted as saying in response to remarks of the former Punjab Chief Minister over the age row involving General VK Singh. With the controversy threatening to snowball in the days to come, the carefully worded statement by the senior Congress leader in Delhi carried a clear message for his colleague to refrain from meddling in Army matters. Sensing trouble, Amarinder Singh was also clarified that his letter to the Defence Minister over correction of the General’s date of birth was “his personal opinion”. In the letter, Amarinder Singh had supported the contention of the Army chief who is currently involved in a bitter battle with the Defence Ministry over his date of birth. Different records show May 10, 1950 and May 10, 1951 as VK Singh’s date of birth. The Army Chief has been claiming that he was born in 1951 and not 1950 as maintained in the records of the Defence Ministry. The Congress had expressed concern over the controversy yesterday. Responding to reports that Army Chief may seek legal redressal on the age row after his statutory complaint was rejected by the Defence Ministry, Congress spokesman Manish Tewari had said that “Armed forces are an institution, which are held high in esteem not only by the political establishment but by various sections of the society. What is happening is definitely a matter of concern. But I would not like to go into it. Those who are charged with the responsibility or are dealing with the issue should arrive at some kind of appropriate solution”. Vora, a deputy bureau chief with a Mumbai daily, was arrested on November 25 by the Crime Branch of Mumbai Police in connection with the June 11 killing of Dey last year. Dey was the editor (special investigations) at afternoon tabloid ‘Mid-Day’. According to police, Vora had provided the numbers of Dey’s mobile and motorbike and his exact location to absconding mafia don Chhota Rajan. "In fulfilment of its commitment to protecting and conserving cow progeny, the state government had passed the amendment bill in the state Assembly in 2010 to remove the flaws in the Madhya Pradesh Gauvansh Pratishedh Adhiniyam 2004," the release said. The Act also obviated the difficulties and made the provisions more stringent. With the enforcement of the amended Act, the responsibility of proving the prosecution wrong would now lie with the accused in cases of cow slaughter. Similarly, those found guilty of cow slaughter would be liable to imprisonment for seven years instead of present three years and a minimum fine of Rs 5,000 that may be increased by the court. The amended Act provides that no person shall slaughter or cause to be slaughtered or offer for slaughter any cow progeny by any means. Besides, no person, including the transporter, shall transport or offer for transport or cause to be transported any cow progeny himself or by his agent, servant or by any other person acting on his behalf within the state or outside the state for the purpose of its slaughter, in contravention of the provisions of the Act or with the knowledge that it will be or is likely to be slaughtered. Justice M R Shah recently rejected Bhatt’s application in the 13-year-old case when he was SP of Porbander district. 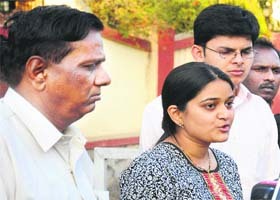 Bhatt had sought quashing of the criminal complaint filed against him. The court also vacated the stay, granted by it in December 2010, on conducting criminal proceedings against Bhatt in the case. The court has further directed the magistrate of the Porbander court to proceed further with the trial and conclude the same within 12 months. All those concerned with the case have been directed by the court to cooperate with the trial court for early disposal of the case. “This court is of the opinion that this is not a fit case to exercise the powers under section 482 of the Code of Criminal Procedure to quash and set aside the impugned complaint and/or order passed by the learned magistrate directing to issue process against the applicant (Bhatt),” the HC stated in its order. Kiaran Stapleton, who described himself as "Psycho Stapleton" at Manchester Magistrates Court yesterday, appeared before the Manchester Crown Court today via video-link from prison. He was remanded until March 20. After the second post-mortem examination was conducted today, the coroner is likely to release the body of 23-year-old Bidve for repatriation to India. Bidve was shot dead on a Salford street on December 26. His family members are expected to reach Manchester this week to receive the body. Today’s developments followed a well-attended vigil in Salford last night at the site where Bidve was killed. Meanwhile in Pune, the Manchester police team investigating the murder of city-based Anuj Bidve today said that they were able to "fill in some gaps" in understanding the events leading to Bidve’s death. “We met Anuj's family last night for several hours and were able to fill in some gaps in understanding the events leading up to Anuj’s tragic death," Greater Manchester chief police superintendent Russ Jackson told mediapersons this evening. Bidve’s family members may reach Manchester this week to receive body. The mini car designed for intra-city urban transportation has been brought out with the idea of targeting three-wheeler customers. Developed in-house by Bajaj Auto, RE60 comes in a different version than that was showcased by the company as a concept car in 2008. Bajaj Auto shelved the earlier project it was set to develop in partnership with Renault and Nissan. After many a hiccup, the company has managed to bring out a model which, incidentally not only marks its foray into the four-wheeler segment, but could see it create a major export market for the product in the countries where it exports its three-wheelers. “Certainly, this is a product the core customers for which are those who use a three-wheeler,” BAL managing director Rajiv Bajaj told reporters here. He said the RE60, powered by a 200 cc rear-mounted petrol engine, could also be sold in overseas markets where the company’s three-wheelers are exported. Four years of hard work put in by the company’s engineers has, however, remained under wraps from the other two partners on the project Renault and Nissan. The two would be witnessing the car for the first time at the Auto Expo getting underway here from Thursday. Bajaj claimed the car had a top speed of 70 kmph and would give the highest mileage of 35kmpl. “This vehicle has been designed for intra-city passenger transport keeping in mind intra-city duty cycles and safety requirements,” he added. The company expects a big growth opportunity by targeting the three-wheeler segment. The RE60 will be manufactured at the company’s Aurangabad plant. It resembles an over-sized hatchback with an elevated roof. Although experts are sceptical about the success of the car following Nano experience, the company management is upbeat about the car as it sees an opportunity not only in the domestic market but also overseas. “We make about 5.2 lakh three-wheelers a year of which only 2 lakh are sold in India and the rest of the lot is exported. So, we eye markets like Sri Lanka that promise huge potential for RE60,” he said. There have been many ups and downs while BAL developed the mini car. As per an agreement with the Renault-Nissan alliance, the company was supposed to develop and manufacture the vehicle and sell that under the badge of the alliance. As such, a concept passenger car was unveiled in 2008. There was partnership with Renault-Nissan for the ultra low cost (ULC) car project. It was to hit the roads in 2011, but was delayed due to differences between the partners on pricing and design. 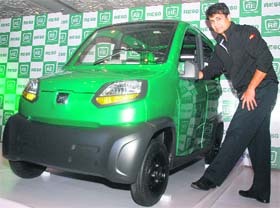 While Renault-Nissan wanted to price the car around $2,500, Bajaj insisted on lowering the overall cost of ownership. In 2010, Renault-Nissan announced the signing of a memorandum of understanding with Bajaj Auto to take forward their ULC car project. “We have confirmed reports that LeT is imparting training to 21 selected female terrorists at its training facilities in Muzaffarabad in PoK for carrying out terrorist activities in India,” an Army official said here. They said the new group, named as Dukhtareen-e-Toiba, is planned to be made active in the Kashmir Valley by the LeT. "We respect Indira Gandhi very much. It was during our days in the Youth Congress when a statue of Indira Gandhi was erected near Birla Planetarium in the city. The fact is that the CPM and the state Congress unit is working hand in hand," said Banerjee. Mamata Banerjee had earlier announced that the Indira Bhawan in Salt Lake, Kolkata's satellite town, would be named Nazrul Bhawan in the honour of the Bengali revolutionary poet Kazi Nazrul Islam. The Congress has, however, refused to soften its opposition to the move. "We demand immediate withdrawal of the decision. We are not against Kazi Nazrul Islam, but you cannot insult Indira Gandhi like this. If the decision is not withdrawn, then we will strengthen our agitation," the party's state unit president Pradip Bhattacharjee said. “The BSP government has installed statues of Chief Minister Mayawati and the BSP election symbol, the elephant, everywhere in the city to promote the party. We will write to the EC in this connection,” SP leader Shivpal Singh Yadav told reporters here.